This RIGS is the site of the spoil tip at the former Betteshanger Colliery, one of the largest collieries in Kent. The colliery opened in 1924-30 and closed in 1989. 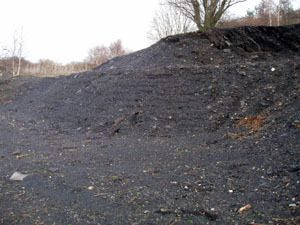 The tip, located to the north east of the former pit, was composed of Carboniferous sedimentary rock, from around 310-312 Ma, associated with Kent No. 6 & 7 seams. The scientific study of these rocks and fossils is important to our understanding of the changing climate and the habitat to be found in Kent during the Carboniferous period. The different fossil plant assemblages already found indicate areas of forest, river levees and overbank (crevasse) deposition. A rare, large millipede-like, arthropod fossil was also found. But more work is needed. The tip has now been landscaped to create Fowlmead Country Park, now known as the Betteshanger Sustainable Parks. It is now operated by Hadlow College and provides a range of leisure activities. As part of the conversion a fossil collecting site has been retained, see figure right, a rock store has been created and displays in the temporary visitor centre will add to the value of the site. 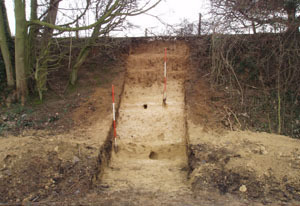 A relic sea cliff (Upper Pleistocene: Ipswichian interglacial), buried under and to one side of A258 Deal to Sandwich road, was exposed in a railway cutting in 1927, and is thought to be located on the entrance road to the new Country Park. 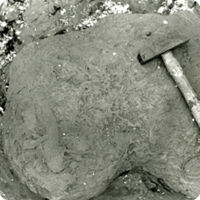 An initial section was cleared in the search for the relic cliff (see figure left), but was unsuccessful. If the relic cliff can be found and exposed it will provide evidence of changing sea levels for scientific use and could arouse public awareness of earth processes. Fowlmead Country Park, now known as the Betteshanger Sustainable Parks, and Nature Reserve was developed under the management of the South East England Development Agency (SEEDA) and opened in May 2007. Access to the geological features will henceforth be via the country park. Safety at the country park will be the responsibility of the new management. Arrangements for fossil collecting, from the area set aside for this purpose, cannot be determined until the new management has taken over control of the site.